Oops - we don't appear to have a video for the fi-6240. The scanner is great, it is clear, fast, and is easy to install… would recommend. 4.5 out of 5. The scanner is as promised, in terms of speed and quality of scans. The hurried passage does not compromise the quality of scanning. It is easy to setup and simple to operate as well. It is working well for our Medical Practice and hopefully should do for other businesses too. 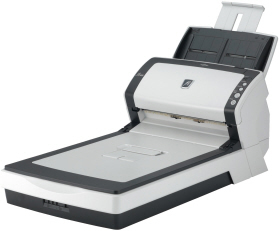 The fi-6240 is the first business scanner in its class to inherit highly regarded intelligent "fi-Series" automatic features from its higher end siblings. Such features facilitate worry free mixed batch scanning of documents containing paper of different weights, quality and sizes. Speedy "auto-color recognition" , "auto-size recognition" and "auto-deskew" functionality - The fi-6240 is the first "dedicated image processing LSI" armed scanner in its class to offer such highly valued automatic functions. As a result, the fi-6240 brings about dramatic digitizing efficiencies through fast scanning and simultaneous high speed image processing. In addition to being able to scan embossed cards*, the fi-6240 is able to scan up to 3 plastic cards at a time (up to 1.4mm thick) in order to meet a wide variety of business needs. As the first scanner of its class to come bundled with barcode and patchcode reading functionality, the fi-6240 is capable of simultaneously scanning and automatically separating different jobs with its automatic job separation function. The result is improved digitization efficiency.